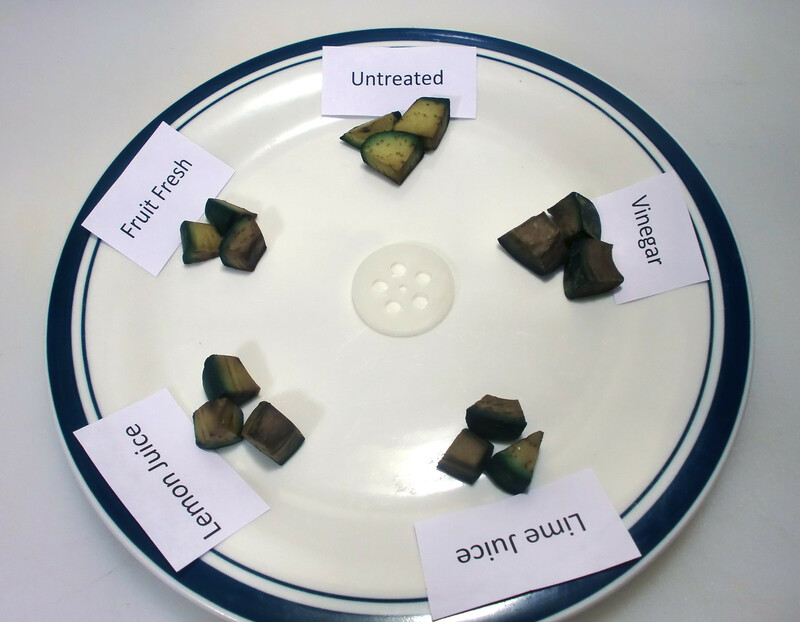 Years ago Koobz asked "Oxidized Avocado: What's Going on & How to Prevent It?" That question has been merged with this one because it's dealing with the same issue. Recently, we had this question: Are limes and lime juice more acidic than lemons and lemon juice?. Now I'm just curious, I want an answer. After Logophobe's answer to the acidity question, and my own research backing up that answer, I feel like I know less than I did before! Lemon contains more ascorbic acid (Vitamin C) and citric acid than limes, yet limes are more acidic overall. Distilled vinegar is more acidic than lemons and almost as acidic as limes, Fruit Fresh is an extremely highly concentrated mixture of ascorbic acid and citric acid specifically developed to prevent browning in fruits. So what works to keep avocados pretty and green? Perhaps some experimentation is in order. I think I'll start with acids, since the common wisdom is that acid helps keep avocados green. EDIT As of 1/8/15, I have added a new answer, as the highly upvoted one really only says what doesn't help. The accepted answer HERE shows the results of further experimentation, and what does help. See the improved answer here: What DOES Help? Which acid works best to keep avocados from browning? It's not that acid doesn't do much to help. For acid, I used freshly squeezed lemon juice, freshly squeezed lime juice, distilled white vinegar (diluted to 5% acidity), and Ball brand Fruit Fresh mixed per package instructions, 2 tsp powder to 3 TBS water. Fruit Fresh contains dextrose, ascorbic acid, citric acid and silicon dioxide. According to the label, 1/4 tsp of the powder contains 230% of the US RDA of Vitamin C (ascorbic acid). That roughly translates to the solution I used having 100X the concentration of Vitamin C of lemon juice. I was not able find anything to give me a basis for comparison of citric acid concentration. I diced 1 avocado and shuffled up the chunks so that no 1 pile had chunks from only 1 part of the fruit. I dropped the chunks into small bowls of the acids, removed the chunks, and allowed to air dry. They remained at room temperature for 24 hours. 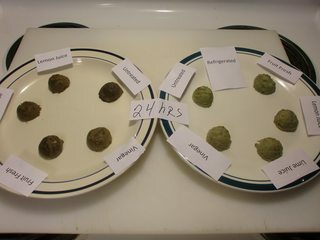 I mashed 2 avocados together and put 50 grams of the mash into each of 5 small bowls. I added 1/4 tsp of each individual acid to each bowl, leaving 1 bowl plain. I mixed thoroughly and scooped the mash onto 2 plates, 1 to be refrigerated, and 1 to be left at room temperature. I washed and dried the scoop between changes in acid. 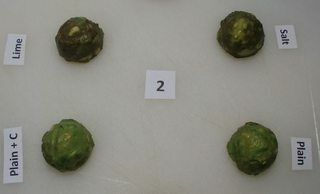 The diced avocados just gradually became darker over 24 hours, with the vinegar treated fruit the first to show signs of browning, and ultimately the vinegar treated fruit became the darkest. The untreated fruit resisted browning the longest and ultimately browned the least. The lemon juice and lime juice were about tied, they both significantly sped darkening and ultimately became significantly darker than the untreated fruit. The Fruit Fresh barely made any difference, but the slight difference there was, was negative. Fruit Fresh also caused the avocado to become darker and to brown faster, but just barely. It's not clearly visible in the photo, but the Fruit Fresh treated avocado was ever-so-slightly more brown than the untreated avocado. At 6 hours none of the refrigerated, mashed avocado was significantly browning. At 24 hours all of the mashed avocado was the worse for wear. On the non-refrigerated side, it looks on this photo like the vinegar treated avocado ultimately fared the best. It actually didn't. I didn't think to snap a picture, but the vinegar treated avocado was the only one to discolor all the way through. The others were still green on the inside, the vinegar treated scoop was slightly browned even on the inside. There came a point about 12 hours in that the refrigerated side just stopped browning. It had dried out, leaving it more green than the non-refrigerated side, but no more pleasant. All of the samples browned and dried out fairly equally. At 48 hours I had one scoop of mashed avocado left that I cared to eat. By adding nothing, keeping it refrigerated and covered in plastic wrap clinging to the surface, so that it had no air at all, this avocado is still fresh, green and ready to eat. I'll add lime now for flavor, and some cilantro and cumin. Pass the chips. I am honored that this answer has been so generously received, but the fact is, it really doesn't answer the question very well. This answer shows what doesn't help. As of 1/8/15 I have added and accepted a new answer based on new experiments that show what does help, it's HERE next to the checkmark. Vitamin C (ascorbic acid) works to slow, even halt the browning of avocados, even in the face of salt, vinegar (in salsa), and lime juice, all of which have been shown (or will be shown) to speed browning. At a concentration of 100mg per 50 grams of avocado, it is also virtually tasteless. You can buy pure ascorbic acid powder, which I did and then promptly lost, or you can use a spice grinder to grind very pure tablets, which I also did. My tablets weighed .59 grams per 500mg tablet, so close enough. I also tasted the powder and it really had no unpleasant chemical flavor, just a bit of acid effervescence feeling. You don't need to dissolve the powder, you can just stir it into mashed avocado. To keep sliced or diced avocados green, mix 1/2 tsp of the powder in 1 TBS of water (it will take some effort to get it mixed, but it will mix) and paint it on the surface or dunk in chunks, let them dry and refrigerate, covered. As shown in earlier experimentation, cutting off all air significantly slows browning. That means not just a lid on Tupperware, but vacuum sealing, a sealed Ziploc bag with the air removed, or at least Saran Wrap* actually on the surface of the avocado. The same principle applies to adding a layer of water, sour cream, or salsa over the surface of the avocado. Enclosing the avocado with diced red onion significantly slows browning as long as the container stays closed. *I specify the brand name of the plastic wrap because I have learned that permeability of plastic wrap varies, and Saran Wrap is the brand I’ve tested. As Ogrecon’s answer says, diced red onions slow down browning significantly, as long as the container that holds the onions and avocado remains closed and airtight. The onions release propanethiol S-oxide gas (that's what causes tearing), and as long as that gas doesn’t dissipate, that gas prevents the avocado from browning. 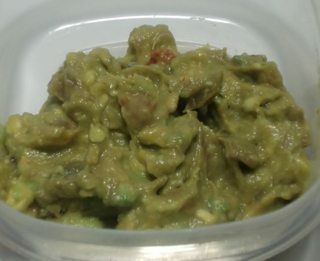 This picture is of otherwise untreated avocado after nine hours in the refrigerator, tightly covered in tupperware containers. Even the containers are identical. One side has the onions, the other doesn’t. I removed the lids to snap the picture. I replaced the lids, and within thirty minutes, I could see the avocado starting to brown on the side with the onion. By morning it was all over. 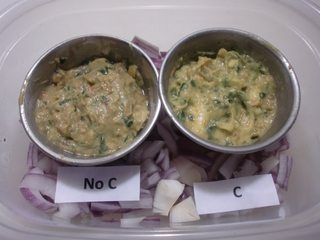 So, if you want to make guacamole in advance, one option to keep it fresh looking is to enclose it with diced red onion. Don’t remove the lid until time to serve. I specifically say red onion because that is the only onion type I tested. Stored like this you can taste the onion, but I find that flavor complimentary in guacamole. 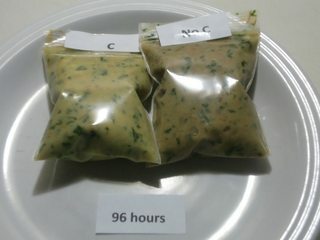 Nine hours isn't necessarily the limit; the onion experiment gets even better; I’ll cover it more in the section that covers Vitamin C.
I had read that salt speeds browning, and I knew from earlier experimentation that lime juice and vinegar speed browning. I looked at Vitamin C as possibly being effective against browning. I added the factors of salt and Vitamin C to the testing of scoops of avocado left uncovered at room temperature. At 2 hours the results are evident. Lime juice and salt both speed browning. Uncovered and unrefrigerated the Vitamin C doesn’t seem to make much of a difference. Per each 50 grams of avocado (as indicated), I used 100mg of Vitamin C powder, 250mg salt or 1/4 tsp freshly squeezed lime juice. Refrigerated and covered, Vitamin C is a whole different ball of wax. I made guacamole using my favorite method. Into mashed avocado I mixed salt, lime juice, fresh cilantro and drained Pace Brand Hot Salsa. (Per 100 grams of avocado I added .5 grams of salt, 1/2 tsp of freshly squeezed lime juice, about a TBS of chopped cilantro and 2 TBS drained salsa). 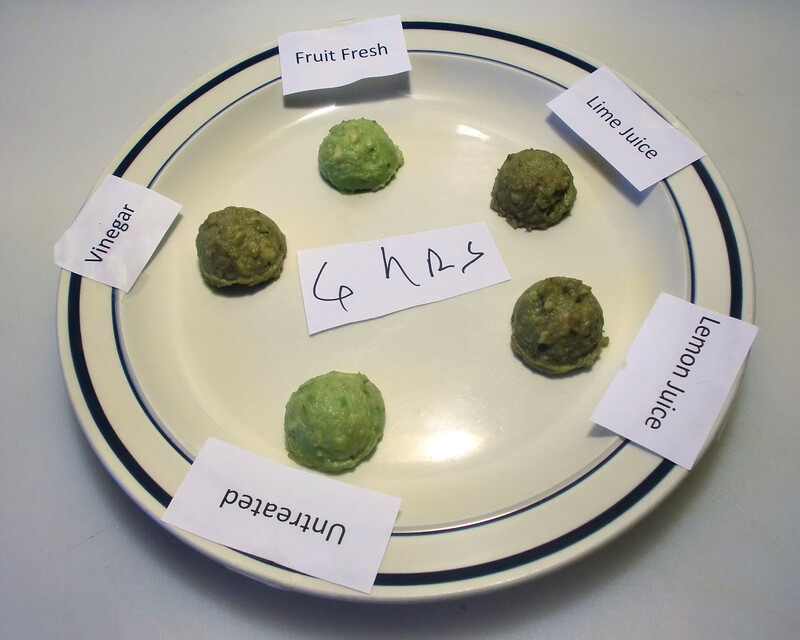 I treated half the guacamole with 100mg of Vitamin C powder (ascorbic acid) to each 50 grams of guacamole. Vitamin C so effectively stops avocados from browning that refrigerated just in a regular Tupperware container (just with the lid on, nothing on the surface) that even in the face of salt, salsa and lime, the guacamole is still perfectly fresh at four full days. So, the bottom line is this: Add Vitamin C to guacamole to keep it fresh and green for a full four days. With the addition of Vitamin C, it actually stays green for even longer, but I suspect that other freshness issues would start to come into play at that point. Use a baggie, a Ziploc bag, Saran Wrap, Tupperware, whatever, as long as it’s covered. OK, I don't necessarily advocate eating week old, homemade guacamole, but it's late and I'm hungry. I ate this. It's a full week old, it's green (not perfect, but pretty close), and it's yummy. Hey! I've got chips getting stale, don't judge me! 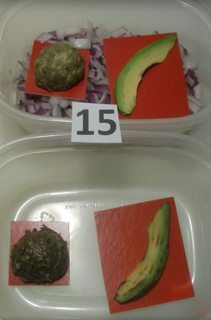 The second best option is to keep the guacamole tightly sealed with freshly diced red onion (other onion varieties may work, but I only tested red). 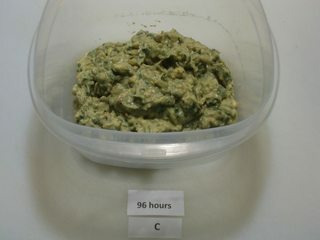 The guacamole will stay perfectly green for at least 9 hours, and acceptable for 4 days, even without the addition of Vitamin C as long as you don’t open the container. So this would be fine if you want to serve guacamole at a party and want to make it in advance. As a third option, vacuum pack the guacamole or use a Ziploc bag with all of the air removed. Even without Vitamin C or diced onions, the guacamole will stay marginally fresh and green for four days. The above options give better results, but giving the guacamole no air at all will keep it from browning unacceptably. Note: I found Wayfaring Stranger’s answer very compelling. I had wanted to include sodium bisulfite in this experiment, but I had difficulty getting it, there are strict shipping rules regarding it. Why? Well, because it’s dangerous. I tried different shipping companies, different sources and obscure local chemical firms. There came a point when I realized I was being silly, no one here is going to buy a compound labeled, “May be fatal if swallowed” to keep their guacamole green. Yes, it is used commercially for that purpose, the results of that experiment might be interesting, but those results are unlikely to have practical value to anyone who would read them here. Since the Vitamin C is both safe and efficacious without the sodium bisulfite, I’m quitting while I am ahead. 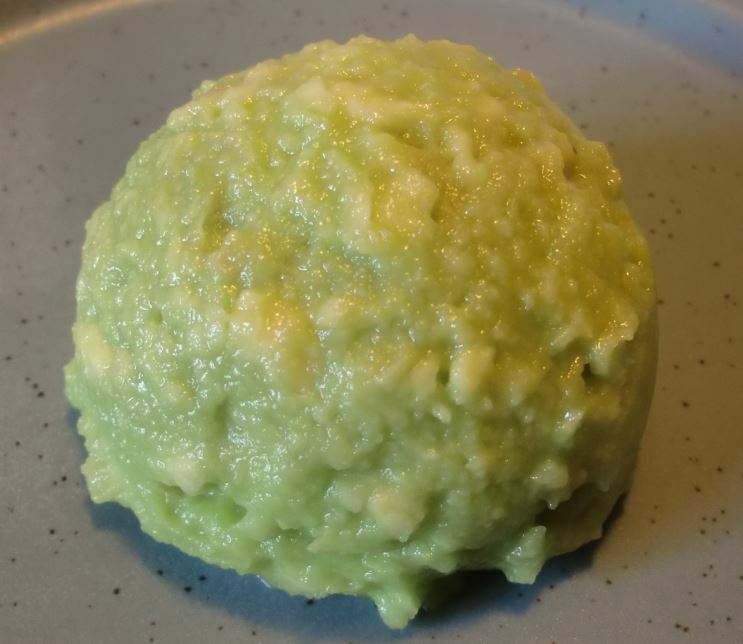 Enzymatic browning in avocado puree and guacamole was evaluated by reflectance measurements for several varieties of avocado with varying amounts of chemical additives. Paste from Booth 8 had a greater tendency to brown than that from Lula. Browning at 75°F was effectively retarded without flavor change by 30 mg percent of sodium bisulfite or 200 mg percent ascorbic acid. Lemon juice or citric and hydrochloric acid adjustment of the puree from pH 6.6 to 5.1 accelerated browning of Booth 8. Combination of sodium bisulfite and ascorbic acid were particularly effective in preventing browning in all avocado preparations under all handling conditions - refrigerated, frozen and thawed, or freeze-dried and reconstituted. The efficacy of sulfur dioxide in retarding browning is thought to be due to the formation of addition products with the polyphenolase enzyme, thus interfering with the catalytic activity. So a little bisulfite might be called for if you must prep the stuff long in advance. Whenever you cut into the avocado, you activate an enzyme, polyphenol oxidase, which causes the monophenols in the avocado to hydroxylate to polyphenols. This results in the browning you see. You can stop this reaction dead in it's tracks by introducing an acid. Which acid depends on what you're making, but I usually use citric acid, in the form of some lime juice. You can however use whichever acid you'd like. Covering your guacamole with sour cream certainly work as well, the lactic acid within might help (although seeing as sour cream isn't really all that acidic, it's probably a pretty minor role), but this effect comes mostly from the fact that you're covering it, so that it isn't exposed to air. You can do the same thing with plastic wrap, just make sure that you don't leave any air pockets between the plastic wrap and the guacamole. Propanethiol S-oxide gas will stop the browning affect on the surface of avocados. This sulfur oxide is found in the gas formed from cutting bitter/sharp onions. When storing guacamole in a bowl, place a half an onion chopped inside a smaller bowl, then place the smaller bowl in the center on top of the guacamole. Then cover with saran wrap as to not remove the accumulated gases from the surface of the guacamole. Take chopped, minced, or diced onion you might be using for the dish and place it directly on top of the avocado dish, with an airtight cover. Mix it in just prior to serving. 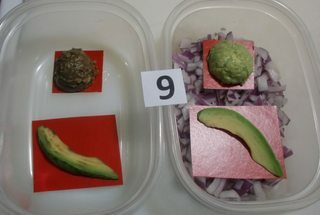 Another example would be to place a sliced onion in a zip-lock with a half cut avocado. This provides oxygen displacement and enzyme reaction reduction using onion gases. Since the publication of Antoine Lavoisier's revised Easter Memoir in 1778, it has been understood (although not at first universally accepted) that acids generally are oxidising agents. However, I note that, somewhat unusually for an acid, formic acid can act as a reducing agent (the opposite of an oxidising agent). My understanding is that this unusual property is the reason for its use as a preservative. It is approved by the USFDA as a food additive when adequately diluted. So, formic acid might work, but note that in higher concentrations it can have harmful effects and it is banned as a food additive in the EU, Australia and New Zealand. I have only tried saving the leftover of an avocado, never guacamole or pureed. The only thing that worked was sucking out ALL the air from a 'ZIPLOCK'brand plastic bag, using a straw. Next time I'm trying a "SEAL A MEAL", though the size of bags I have will be overkill for the small leftover fruit. I am missing mention of the conventional wisdom trick to keep avocados from discoloring: keep the kernel in. That does not really help with readily prepared dishes but it does help with partially used avocados. Not the answer you're looking for? 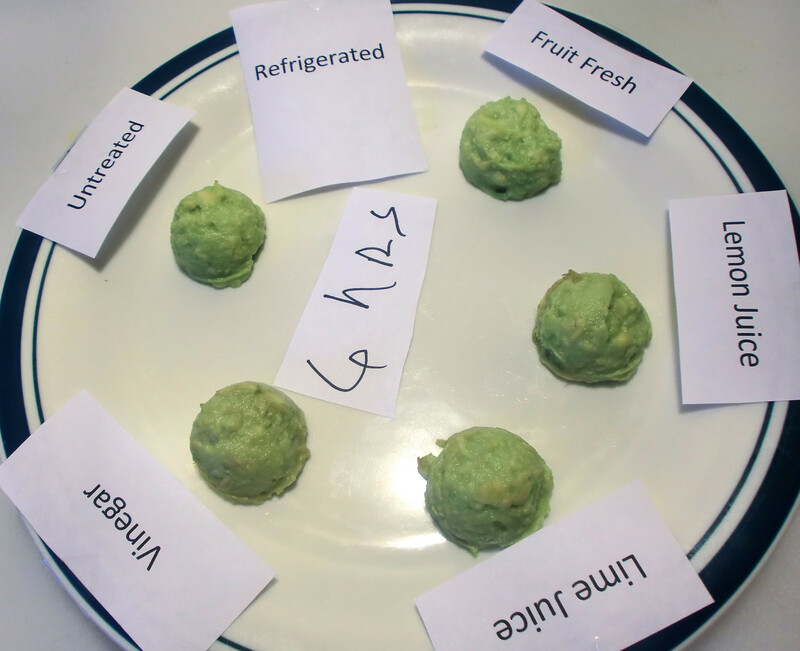 Browse other questions tagged storage-method acidity avocados or ask your own question. How can I remove the peel and pit of an avocado without the whole thing turning into mush? Are limes and lime juice more acidic than lemons and lemon juice? How do I know when my avocado has gone bad, and how can I keep it fresh? Does an avocado seed help guacamole stay green? How do I tone down onion sharpness already in the chicken salad? Why are avocados so expensive?